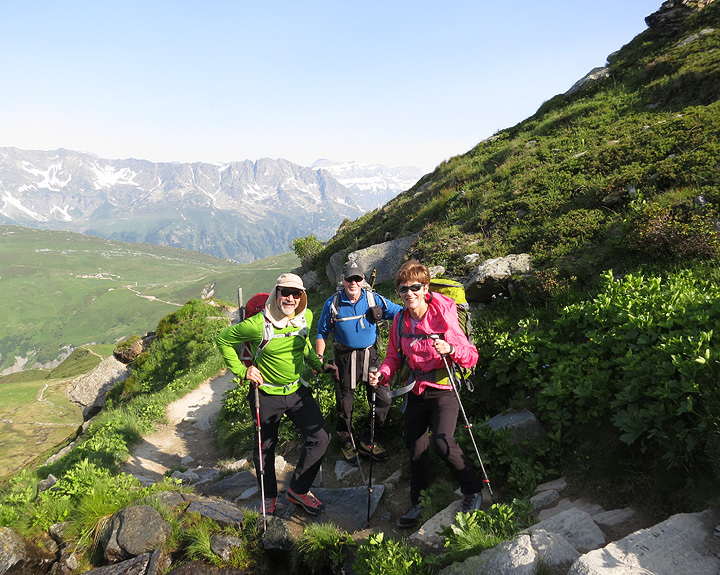 Kathy's Chamonix to Zermatt Haute Route Glacier Trek this year was with a small and tight-knit group of strong mountain walkers. 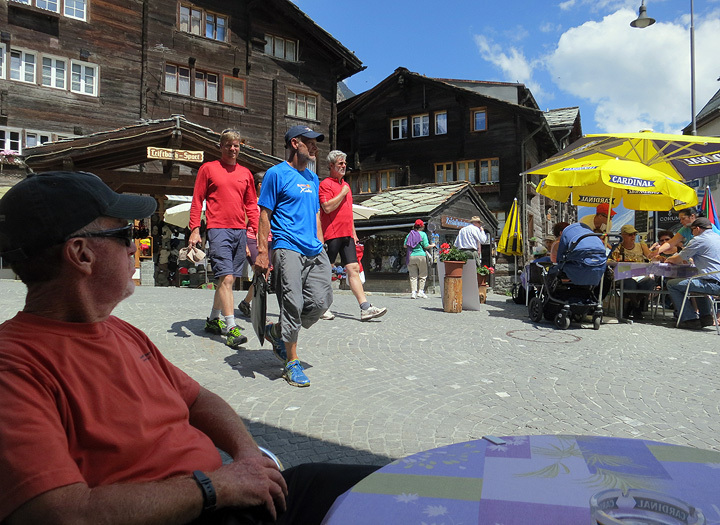 We followed a fairly intense itinerary with little rest for the weary, but plenty of good times and good fellowship. 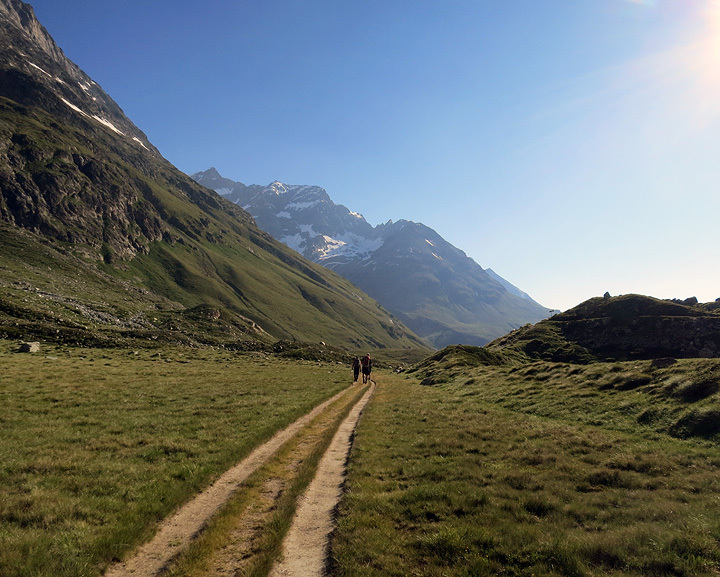 Shortly out of Le Tour, we pause en route to the Tour Glacier. From left to right: John, Andy, Laura. 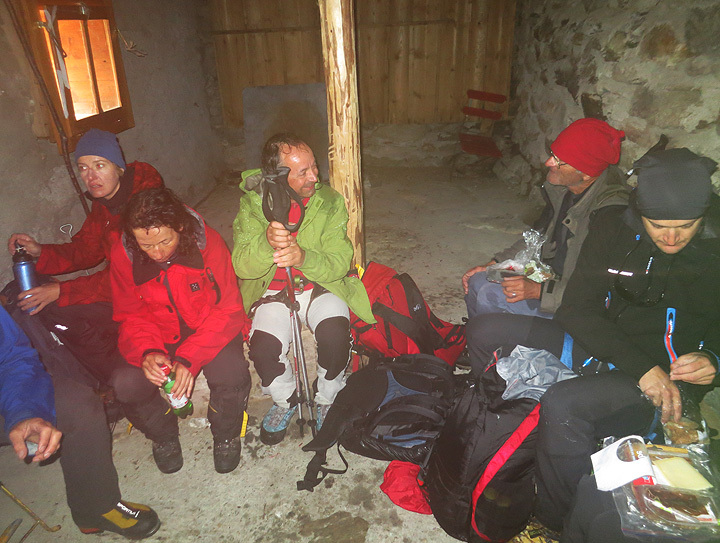 Once again, no photos from our first long and busy day, but here we are descending to the water intake at Saleina from the Orny hut on the morning of day 2. The spire in the background: the "Petit" Clocher du Portalet. 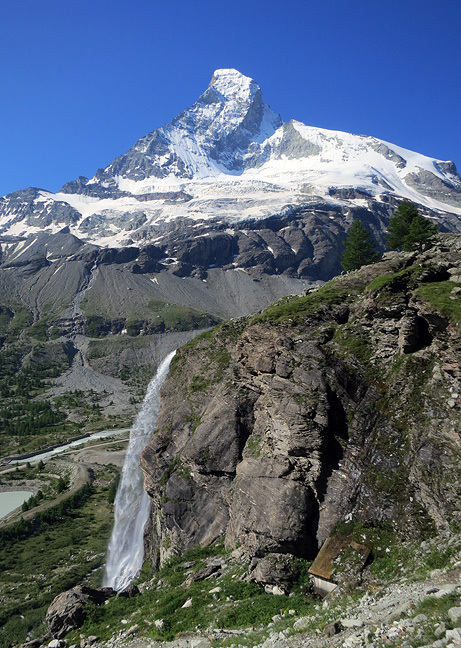 The Saleina glacier on the left. A taxi transfer to the Mauvoisin dam, and it's off again after a brief mid-day pause. In the meadows above the lake, a riot of wildflowers! The wet spring and late snow melt-off have made for a really exceptional flower season it seems. 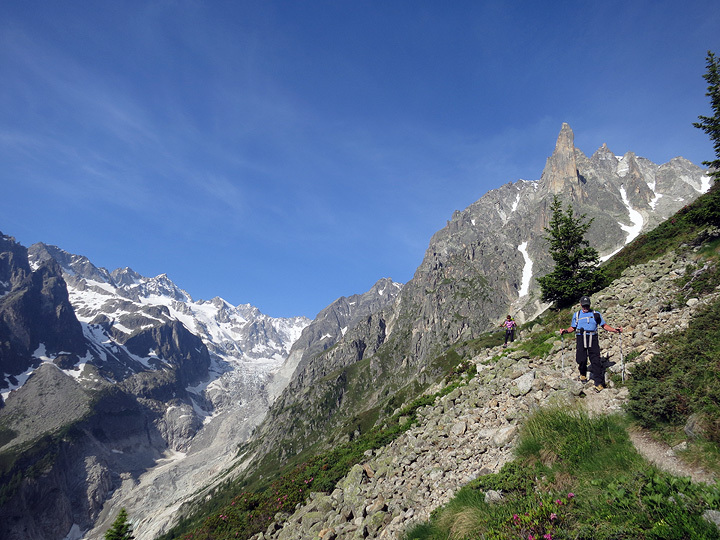 Just as athe trail seems like it will go on forever, we reach our high point at last at the Col de Tsofeiret. It's downhill (mostly) from here to the Chanrion hut and the end of our day's walking. 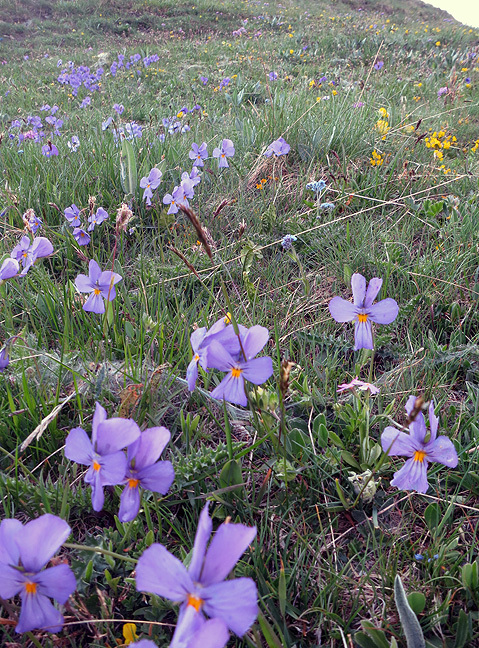 The meadows around the Chanrion hut are always amazing in July. This time it's the violets that greet us in crowds. 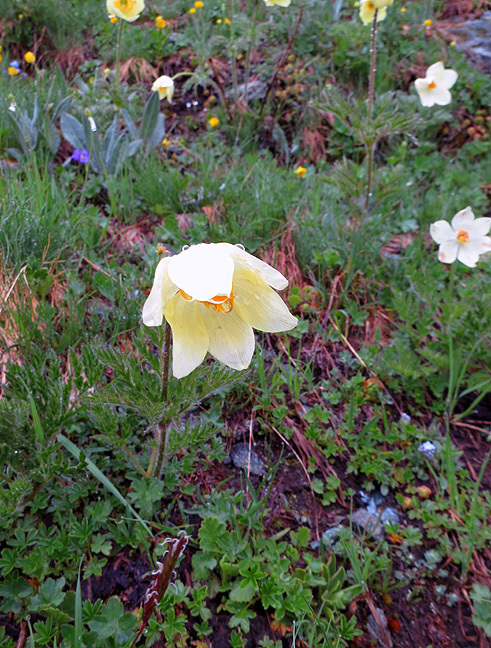 Primroses and orchids were also prolific nearby. A real display. 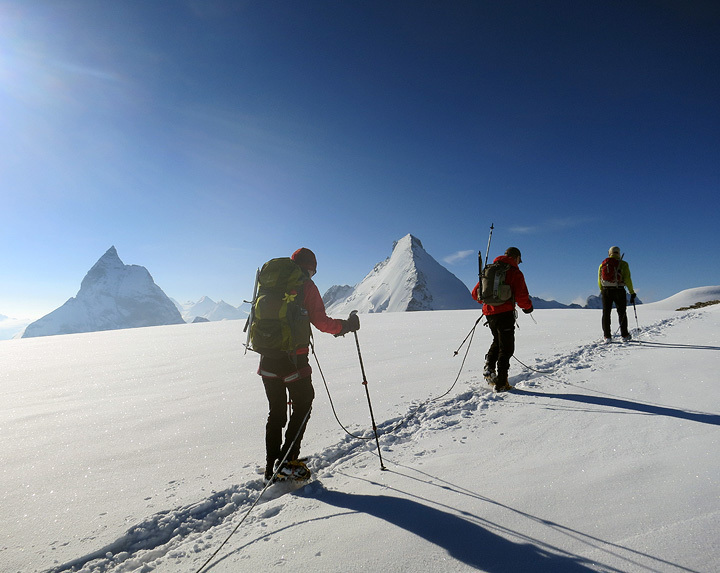 After a good night's sleep, we were off to the Dix hut. Climing up to the first of three cols this day, with Mont Gelé and Mont Avril in the background. 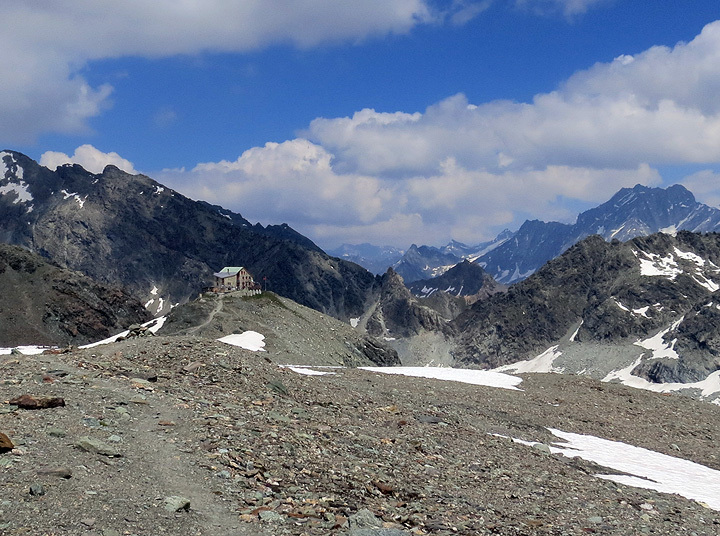 Again it's a long walk over two glaciated cols, but at the end of it all the Dix hut welcomes us in the mid afternoon sunshine. Hut living at its finest! Everyone is taking advantage of the sun while it lasts. You can never count on it in the mountains! In fact it was raining the following morning when we set off. 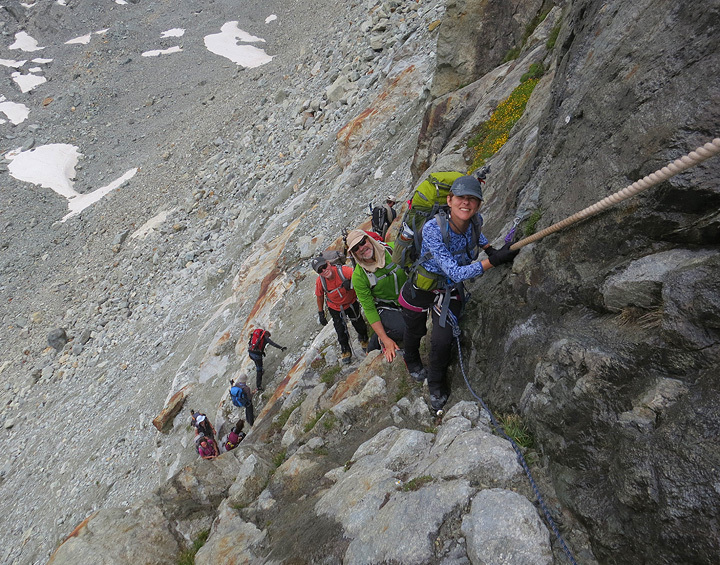 Not wanting to risk the high crossing of the Pigne d'Arolla in stormy weather, we exited stage left to the ladders of the Pas du Chèvre, and took a lower-elevation route to the Vignettes hut, our next halting place. 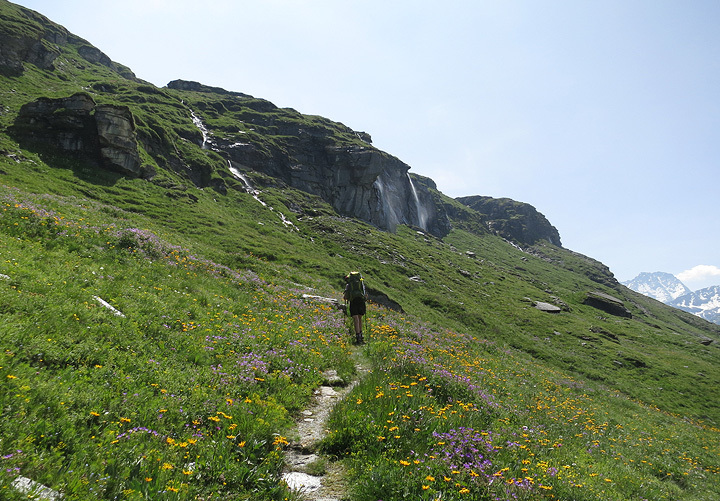 Flowers in the rain, as we descend reluctantly toward Arolla. 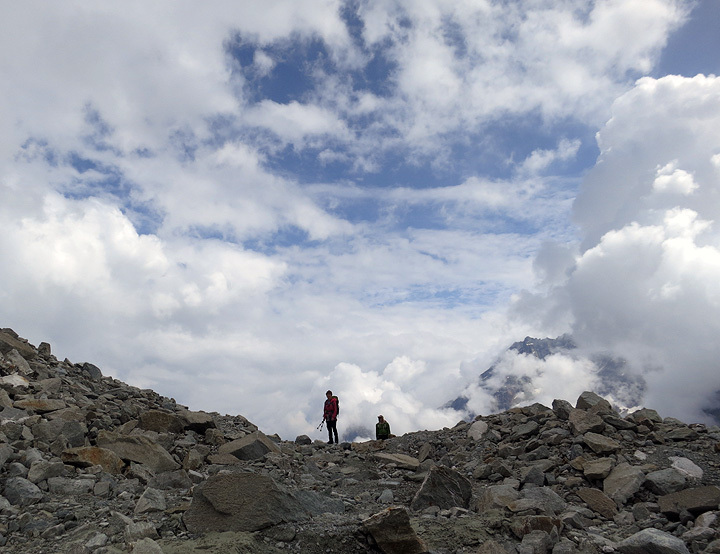 The skies did clear by the time we got back up toward the glacier. 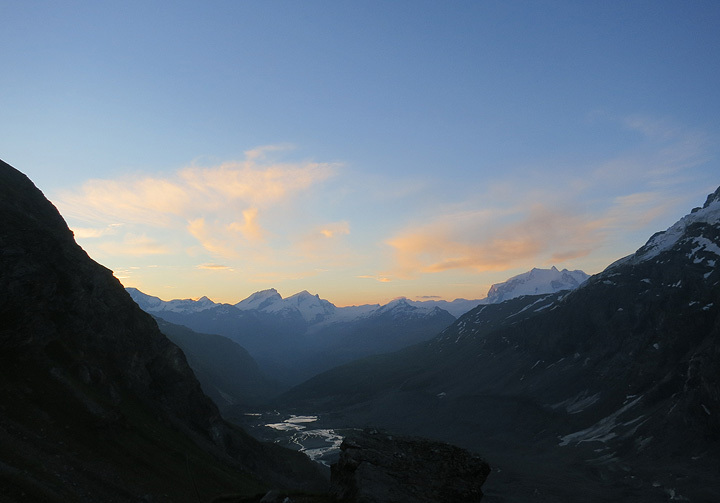 The following day was forecast for more rain, but it dawned relatively clear and very beautiful! 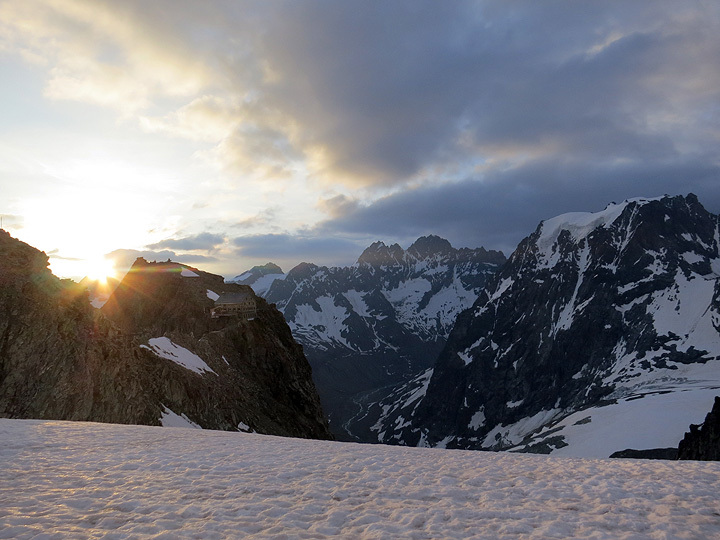 If you look closely you can just make out the Vignettes hut clinging to the rock just to the right of the rising sun. 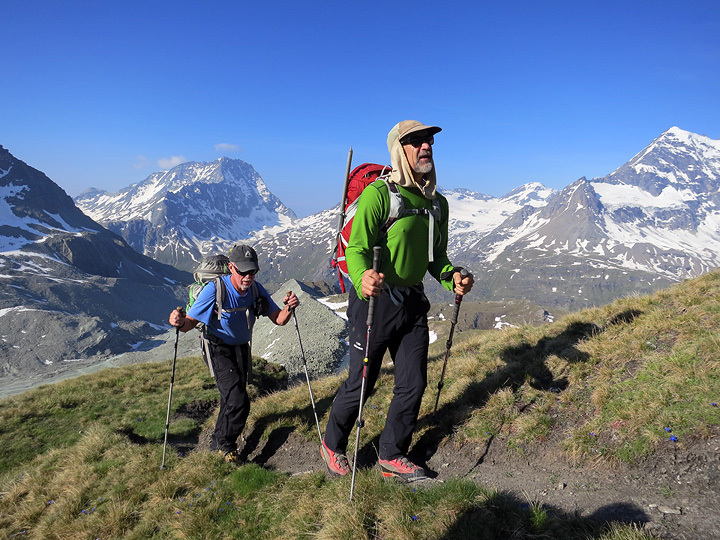 Very nice sunshine as we head off across the broad Col de Charmotane, with the Pigne d'Arolla behind us. However, our good luck did not last long. Nearing the Col de l'Evêque, the mists are lowering like a hammer. 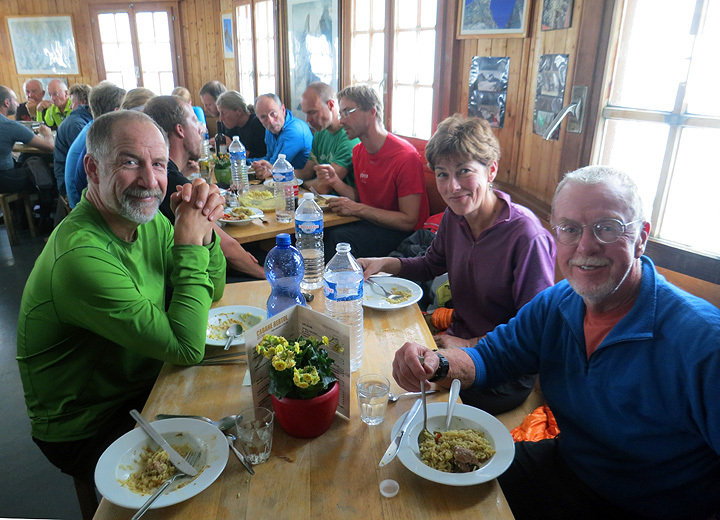 After a hectic and VERY wet crossing of the glacier, we take shelter for lunch in an old herdsman's cabin at the Plans de Bertol. Not the only ones with this great idea, obviously. A welcome respite despite the squalor! 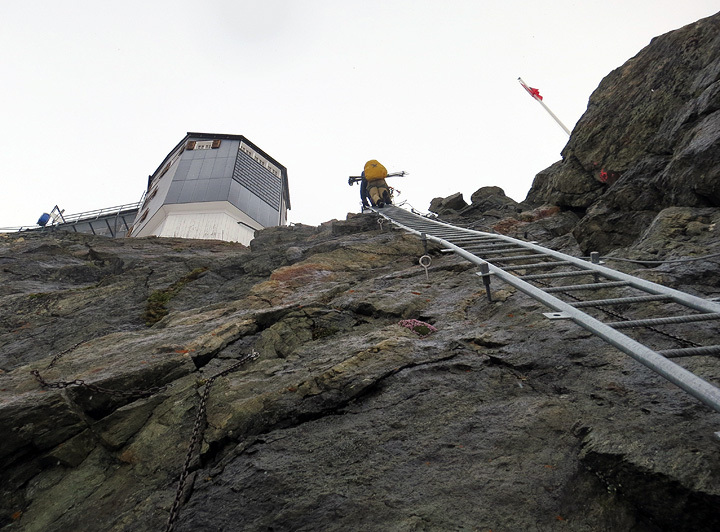 The rain thankfully stopped by the time we got to the mighty fortress of the Bertol hut. 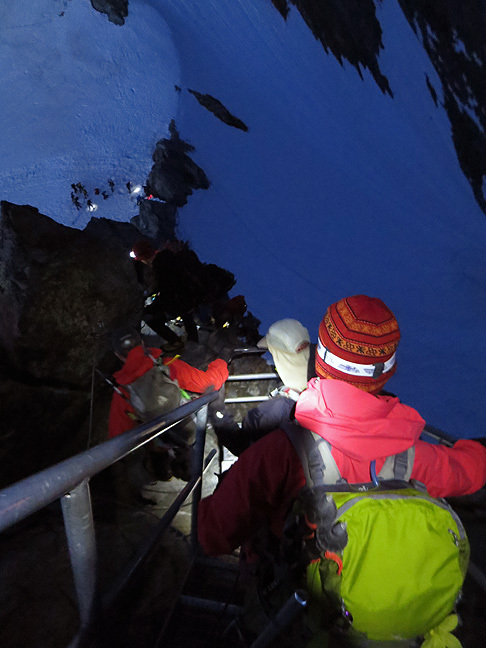 The long trek to the Schonbiel hut begins before dawn, wth the steep ladder descent by headlamp! What fun. 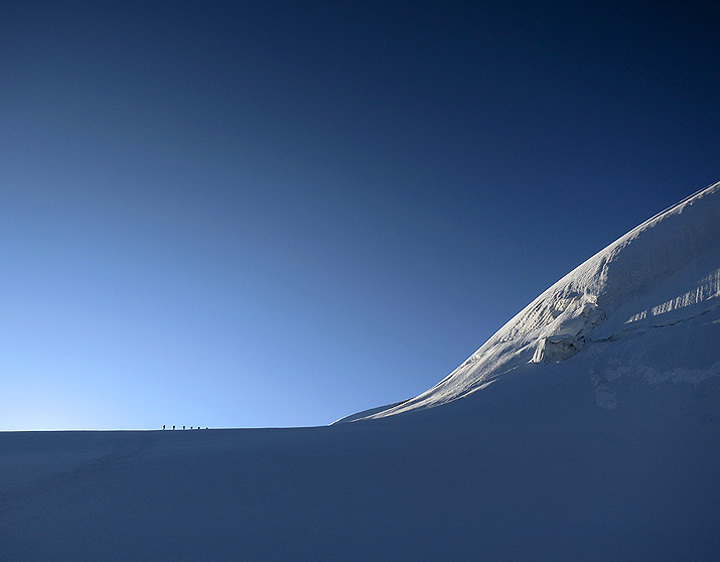 A cold start to our walk, we are eager to hit the sunny slopes of the Tête Blanche. 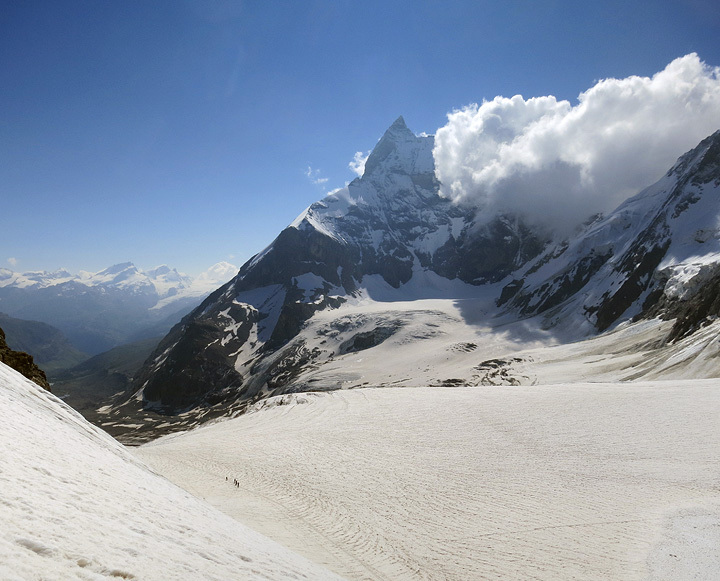 The Matterhorn (left) and Dent d'Hérens (center) come into view as we near the top of the Tête Blanche. 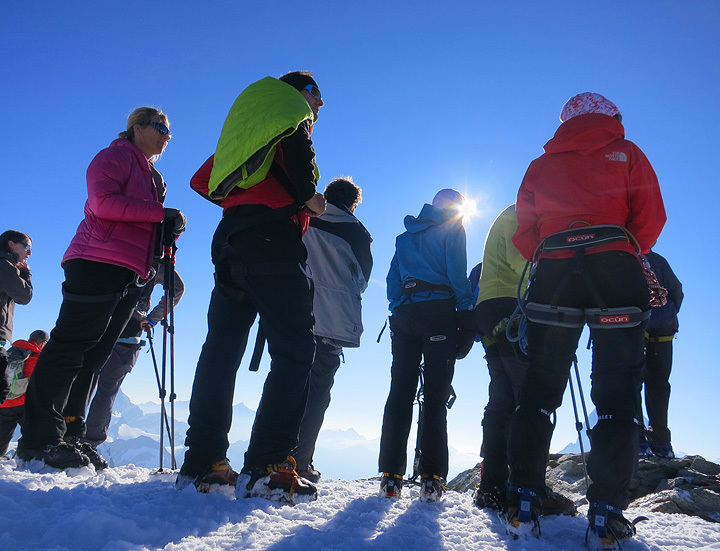 A busy morning on top, everyone is in high spirits taking in the view, and knowing it's almost all downhill from here to Zermatt! 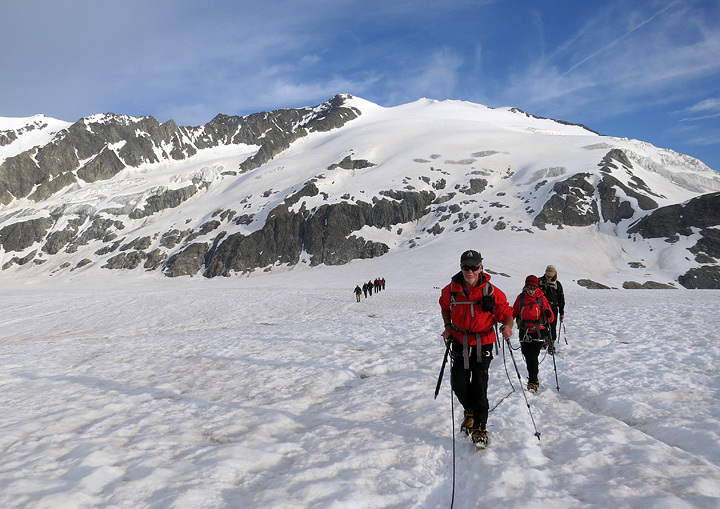 Due to the deep and lingering snowpack this year, everyone opted to stay on the "skiers" route down the glacier, rather than tackle the delicate and laborious descent of the Stockji. 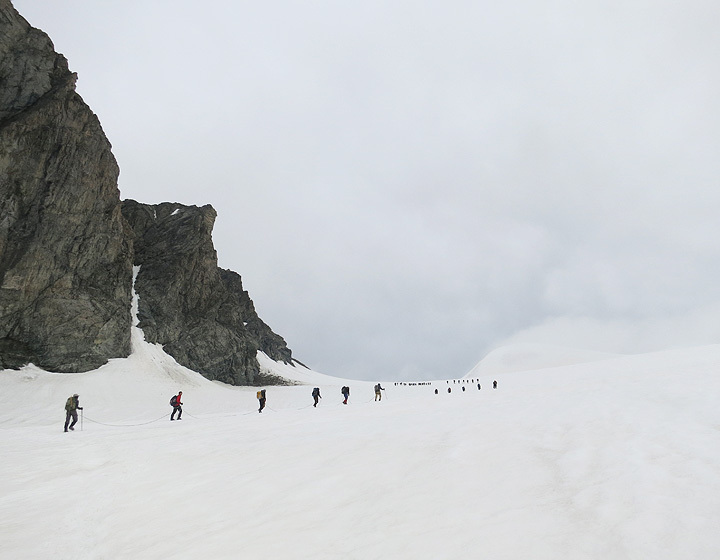 Nearing the end of the glacier now. 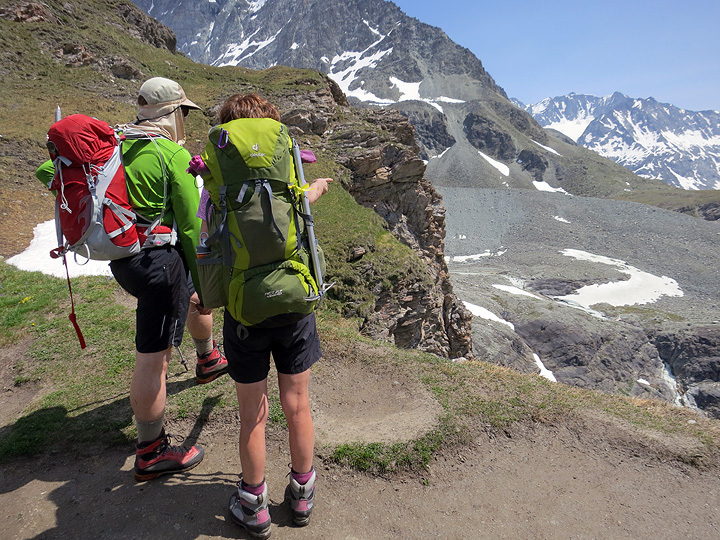 After the inevitable battle of the boulders, we pick up a handy fixed-line route up the cliffband below the Schonbiel. 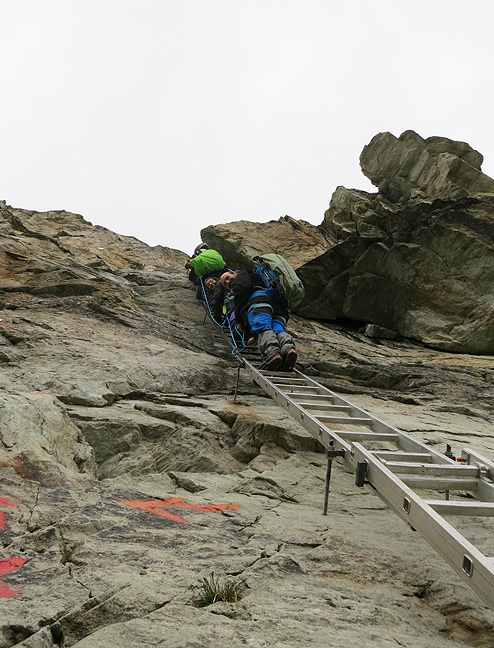 A nice alternative to the ever-shifting track up the steep unstable moraine! 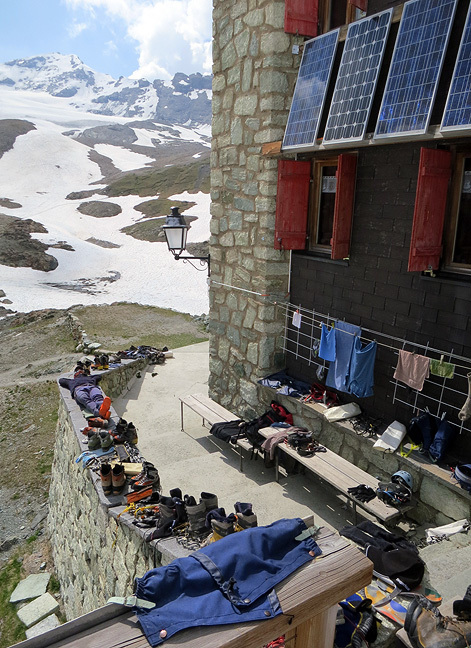 Last steps in to our last hut. Looking forward to coffee and cake! This photo speaks for itself, methinks. Oooaaaahhh! Cold squalls hit again before dinner time though! Fickle mountain weather. The following morning dawns clear and calm however for our last walk into town. 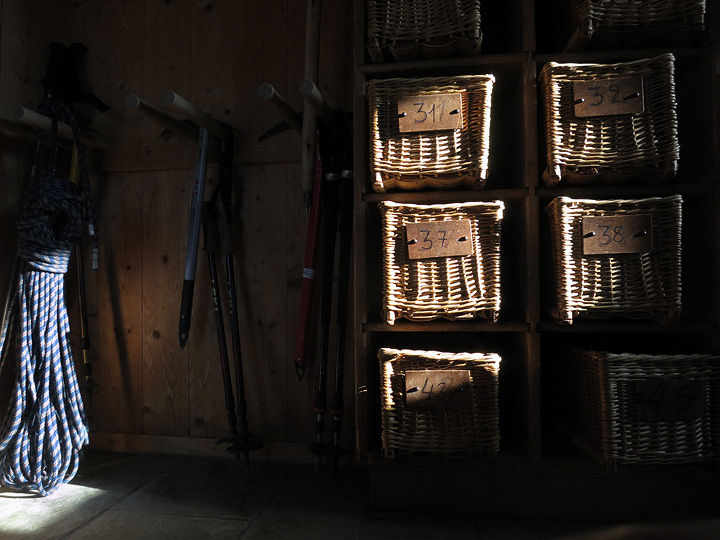 Hut scene at sunrise. A tranquil start. Descending back to the land of living beings. 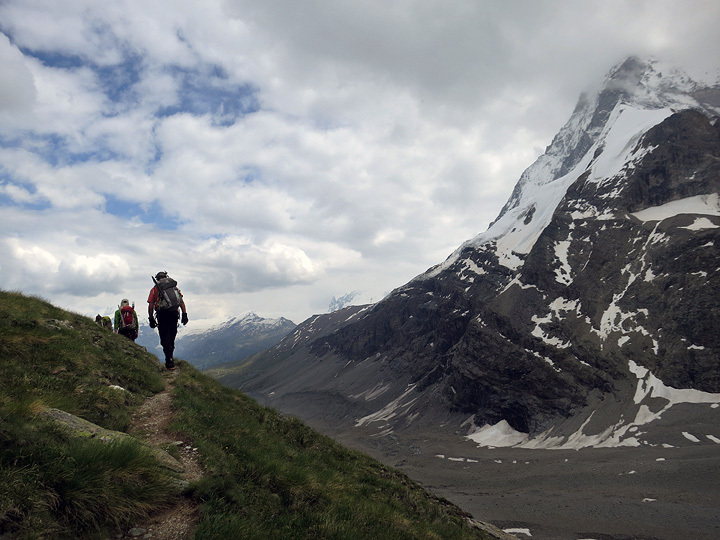 The Matterhorn becomes more familiar as we pass across from its North Face. 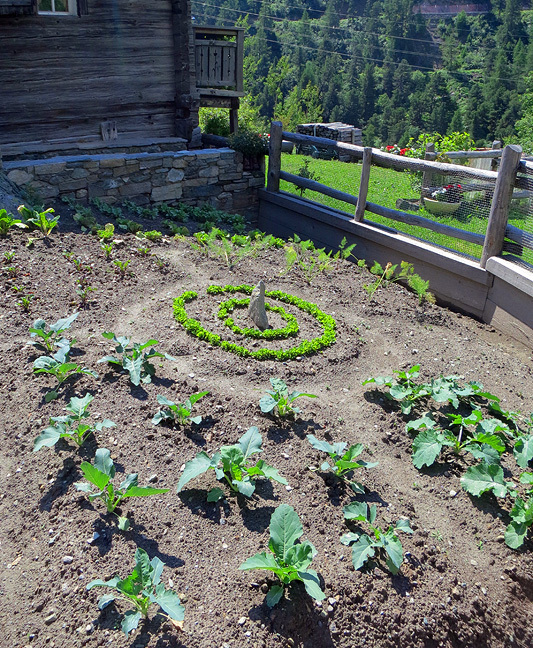 Lovely gardening touch, in homage to the Matterhorn, in the meadows below Zmutt. 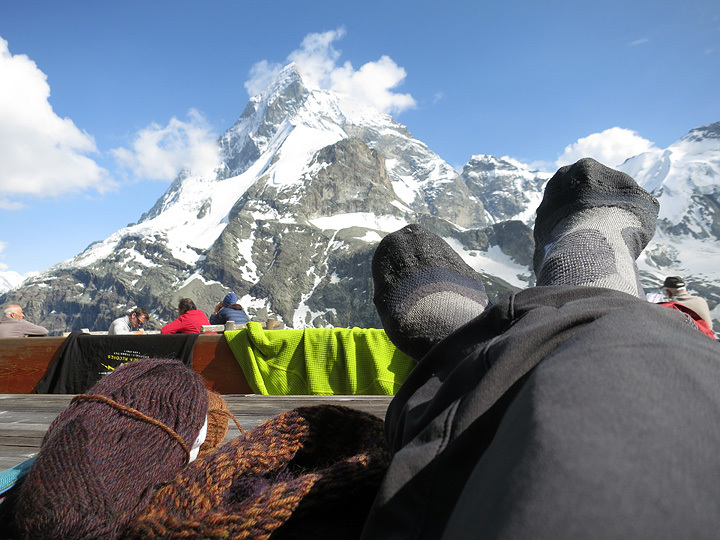 All too soon we are back in the "flesh pots" of Zermatt, basking in the heat and ready to see what's on the menu! It was a great week. Thanks to John, Andy and Laura, I hope we meet again.